Rooftop botany goes to ground - my plant nursery: The Gift of Life, and When Do I Give It? It's Sunday and that means market day in Columbia Road, London, E2. It was strangely quiet today so I took a few snaps. Nice Hellebores but none of the spotty ones I'm willing to swap a kidney for. Hello, sorry it's been a while but there's actually been some work to do up here on the roof, some good, some bad. My main success story broke only yesterday as I was checking bulb pots in the rain and, half-heartedly picking up a pot of Narcissus serotinus, I spotted first one little green blade with a black sed pod on the top and then another and then began to lose count. Great news because it gives the seedlings the longest possible time to form bulbs during their growing season. The plant itself is a gorgeous, incredibly dainty little thing with starry white petals with tiny orange or yellow cups and thin, grassy foliage. I have no way of germinating seed at the good, old 18-21C (I have the propagator but there's only one place in the house where it would get enough light and I'm not allowed to put it there - one man's daily thrill is another's heated plastic box full of germinating seeds) so my germination tactic for everything is to use the weather to replicate as far as possible the required conditions. I often don't know these but find that if you follow a few basic rules, you stand a good chance of success, especially if you aren't in a hurry. Big seeds (SweetPeas, Flag Iris) need the hard outer coating loosened, a process known as scarification and this can be done in several ways, by far the safest being a good 24-48 hour soaking in water. 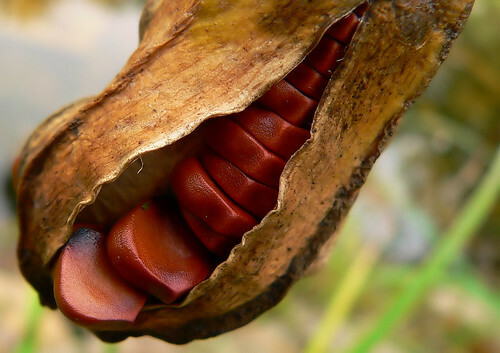 The other option involves a steady hand, a very sharp knife and intimate knowledge of the inside of the seed. You're not looking to remove the seed coating, just nick it enough to allow the exchange of liquid and gases. The former method will take longer because it only softens the coat but it there's not risk to the embryo so It's my preferred option, although having said that I recently sowed some enormous seeds of Iris viriginica var. shrevei that were big enough to try option two fairly safely. The proof will be green and sword-like! Most seeds are far too small for this of course and if you're planting a forest, life is too short: nature doesn't have a Stanley knife. The other process many seeds need to go through is stratification which varies with the genus and species but essentially it's recreating winter to fool the seed into thinking that it's spring. Most people do this with all manner of complicated behaviour involving bags of damp peat or vermiculite and the bottom of the fridge. What I tend to do to avoid this is sow the seed in autumn or winter. Most seeds "need" cold, warm, warmer. Or variations thereof. But get the basics right and you have a better than 50/50 chance, even with "difficult" seed. If the seeds come with instructions then obviously follow them. However, when you get to the level of sees swapping and buying envelopes of bizarre looking things from Namibia with only then name on the envelope, you need to follow a few basics. Use a suitable container; if you have lots of seeds use a big tray so they aren't crowded and you can prick them out without damaging others. Use a suitable compost, it's up to you if you go with peat (naughty!) or soil-based or one of the rapidly-improving peat-free varieties. Make sure it has some food in it, the amount being dependent on how long you expect the plants to be in it. Something like bedding pants are only going to be in a for a few months but something more ambitious such as Lilies or tree saplings would benefit from a handful of slow-release granules or blood, fish and bone. This won't last forever so an all-purpose liquid feed will be needed too. 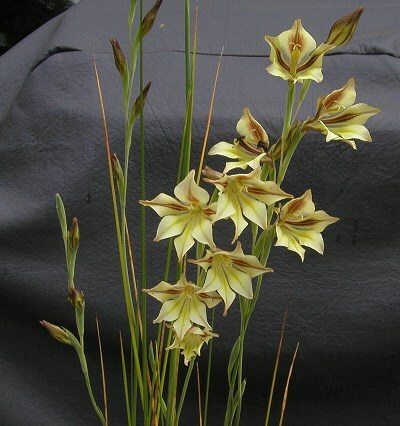 Despite being sown in the autumn, these Lily seedlings were able to form "true" leaves and therefore, we can surmise, a tiny little bulb to keep it going for a short time but regular feeding (fortnightly in the growing season) will help to form a bulb of flowering size a year or two earlier than one left to fend for itself. Lilies vary hugely in the speed with which they attain maturity but good feeding can turn one of these little beauties into a 2m stunner in five years. So, you've chosen your pot/tray and medium in accordance with what you're growing. If you have big seeds that will be in the pot a while you'll probably want to sow singly and at least 2cm deep, otherwise all the roots are going to get tangled. If it's something like Meconopsis or Primulas a large tray is best. Get the sowing surface as flat as you can (you can buy tampers for this but frankly, if you can't use your initiative and find something flat in the house or garden you don't deserve gorgeous drifts of blue in your garden). I tend to use the bottom of a large pot. Sowing tiny seed such as poppies is fraught with danger: make sure it's not windy or your neighbour will wonder why they have green foxgloves in their garden. The BBC's expert plantswoman Carol Klein recommends mixing the seed with a little sharp sand before filling your left (or right if left-handed) palm with the mix and using the natural groove the palm forms to tap the seed on to the surface. This way you can see where you've been and sow thinly which will make life so much easier them it come to pricking out. There's no need to cover such small seed: take a watering can with the rose facing up and start pouring somewhere harmless, then when you have a steady flow pass it over your seed tray a few times. This will be enough to settle the seed in. DON'T FORGET TO LABEL with the name and date, so you can make adjustments next year if needed. With medium-sized seeds big enough to manipulate such as Lilies or Irises, use a pot or tray depending on how long you plan to keep them there and how many you have. With both I use a 4-5in squat pot (sounds like something you'd take to Glastonbury) and fill to 1cm from the top with a mix of compost, vermiculite, feed granules and, depending on the lily, some orchid compost which is ideal for recreating a woodland root-run. The Lily seeds are flat so once sown easy to push round with the sharp end of the label to give them all a bit of room because I leave them in for two years so they can build up a big enough bulblet to handle and pot up in a 10cm pot. But I'm getting ahead of myself. Once the seeds are distributed to your satisfaction, you can either use a garden sieve to cover with compost but not lumps, or fill the the brim with perlite, or both. Irises are just the same but I soak them for a day or two (which makes them stick together so the label is essential for distribution or you'll get something akin to frogspawn. Push them just into the compost and cover, as with the Lilies. Do this in the autumn (fall) and you'll probably get a decent showing before winter. Both my mixed Lily hybrids and Iris Douglasiana hybrids were treated in exactly this way and some of the Lilies managed true leaves before things got too cold (although they're all still in leaf, some yellower than others) and the Irises look great. Apart from the Narcissus, other genera to have germinated during this winter are Lewsias, Gladioli, Meconopsis, Primulas (of the candelabra sort), Rhododenrons (which damped off, a lesson learned), Digitalis, Clematis, and very rare Delphinium. Lewisia Coytledon "Sunset Strain". Another of those genera that fills this grower with pride when he manages to grow it from seed. And take such a great photo of it! The sublime Gladiolus tristis. See above for self-esteem boost, below to see into the future. I should thin these out but will probably leave them in there for two years before moving them on to individual pots, possibly their permanent home. Delphinium zalil from Afghanistan, the only yellow species I'm aware of. I've sown D. nudicaule, with red flowers. I'm hoping to be the first to produce an orange! So what I'm basically saying is, (the Gladioli is an anomanly) unless it's a pitcher plant from a previously uncharted island off Kalimantan, or not hardy, or has unusual dormacy - and even then it's worth a go - is sow them in autumn or winter and if the autumn ones come up, bonus! If they don't, they'll get a thorough stratification over winter and should germinate in spring. It's not foolproof but it saves a hell of a lot of mucking about with bags of damp peat net to your lettuce. I've planted a huge amount of species (not seed because everyone except Chilterns only seem to do 5 for £2. Hardiness is something I'm having a real issue with at the moment, it being January and me being keen to get going with my South African (and similar) seeds. I'm assuming they don't need a cold spell to germinate as, while I know it can be cold at night in such parts, it's never frosty or anything. I have read about a need for big swings in temperature, so perhaps that's their version of stratification? Well, it's not something I can replicate so I'm just going to have to trust to luck. The propagator is not an option so I have to wait until weather warms up, I suppose and try them outside, although with so few seeds of most - literally five - I'll have to wear my lucky pants when I sow them! It's confusing because the so-called Spider Iris (not an Iris at all) Ferraria ferrariola is rumoured to be hardy to -10C but I've no idea at what temperature they might germinate and, having trawled the web, I don't think anyone outside of Kew would. 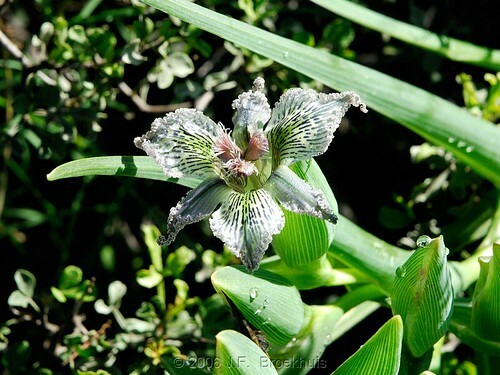 Ferraria Ferrariola or "Spider Iris". I have five seeds. The plant is allegedly hardy to -10C but I am sceptical. Do I sow now and risk losing all five or wait? I suppose I'll just have to be patient and enjoy the Lilies' progress, all the bulbous Irises ( and Frits, if any other than affinis are alive. Oh, and the dozen Rhodies I've sneaked past the censor. No, I don't really get it either but I'm not going to turn down a pot of bulbs on the windowsill! At last I have my own Iris "Katharine Hodgkin"! Obviously there are more than one, it's just that this one reached sunlight first! And most importantly of all, all my junos are up and at it except, ironically, bucharica, the easiest of the most diffucult! Here are svetlanae, zenidae, orchiodes and aucheri, which I'm growing in the open (largely for reasons of space).